Posted in Healthy Home & Garden on March 5, 2013. Last modified on March 26, 2019. Read disclaimer. Lack of garden space does not have to prevent you from growing a few vegetables and herbs. Many of these plants are quite adaptable to growing in a small garden space, large containers, window boxes, or even hanging baskets. Get creative and get growing. 1. Sunlight. Most vegetables will need at least 6 to 8 hours a day to form and ripen fruit. A little less sunlight may be suitable for crops like cabbage, broccoli and leafy greens. With as little as 4 hours you can still grow lettuce, greens, onions, parsley. Most herbs will grow, but have better flavor with more sunlight. 2. Space. Do you have access to a flower bed or similar area where you could include some edible plants? Perhaps you have a sunny patio large enough for a few large pots. 3. Soil. Landscapers have a saying, "plant a $10 tree in a $1,000 hole." By that they mean, soil is one of the most important factors in any plant's growth and production. This certainly applies for vegetable gardening! While the addition of organic matter such as rotted leaves, composted manure and lawn clippings is almost always beneficial for improving soil's microbial activity and nutrient and moisture holding ability, adding lime and fertilizer should be done more carefully. A great way to start is with a low cost soil test available at home improvement stores and garden centers. Better yet, check with your local county extension office. Many offer soil test kits for free! By adding only the correct minerals, and in the proper ratio and amounts, we're saving money, promoting healthy plants and preventing excess fertilizer from eventually ending up in lakes, streams and drinking-water supplies. 4. Water. Plants in containers may need watering daily by midsummer. If plants are in the ground you may need to have a hose available. If possible, water plants at ground level (rather than with overhead sprinklers) or in the morning so that midday heat evaporates water droplets from the leaves. Water that remains on the leaves overnight, for example, may make some plants more susceptible to disease and fungus growth. 5. Time and Ability. Will you be home every day to check watering needs? If plants are in a patio bed you may need to be able to bend and reach to weed, prune, and harvest -- though practices like adding mulch between plants can cut down dramatically on weed and desease problems. Large containers may need to be planted in place or on rollers as they will be very heavy. Vegetable and herb plants do not have to be "ugly." Include some flowers, especially in the front or corners of a bed, for color. Parsley, lettuce, kale or spinach can make nice edging. Some herbs are perennials. Lavender and rosemary can be small ornamental shrubs in a landscape bed. Creeping thyme or oregano can be ground cover. Put tall plants in the back of the bed-staked tomatoes, okra. 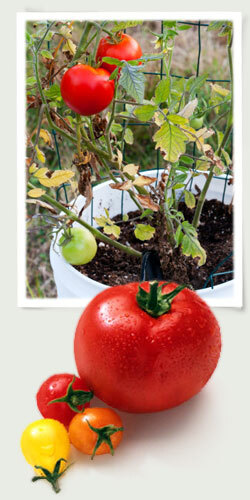 Use a trellis or existing fence to train tomatoes, beans, cucumbers, and melons. Hanging baskets can be suitable for cherry tomatoes, bush type cucumbers, lettuce, parsley, mints. Use your imagination. Use recycled containers: five gallon buckets with holes drilled at the bottom, bushel baskets, plastic or metal tubs (avoid containers that held toxic substances), recycled nursery pots. (Tip: The bakery section of our local grocery store has been a fabulous source for clean, 5 gallon, food-safe plastic buckets -- the ones that cake frosting comes in.) Though they will last much longer, avoid using pressure treated wood containers because of the chemical preservatives they contain. Make sure all containers have adequate drainage. If holes are in the bottom of the pot, use "pot feet" or small blocks to raise the pot off the surface. Otherwise, create a few 1/4" holes on the sides, near the base. Before adding soil to the container, put an inch or two of rocks or marbles in the bottom to permit better drainage of excess water. Use good quality potting media, not garden soil. Do not over-crowd the container with too many plants. Give them room to grow. You can incorporate some slow-release fertilizer per package instructions, or use liquid fertilizer such as fish emulsion or soluble fertilizer every couple of weeks. Pay attention to water needs. Some plants will dry out faster than others, especially in containers. Put on enough water for some to run out the bottom of the pot each time you water. Check for pests. Occasional infestations of aphids or mites can usually be handled with organic insecticidal soap sprays. Caterpillars and slugs on leafy greens can be picked off.